Building the platform for future! The curriculum of the Bachelor of Business Administration (BBA) at RTU Riga Business School is based on the curriculum of the BBA programms of two of the leading business school in Europe and US - BI Norwegian Business School and University at BuffaloSchool of Management. The curriculum focuses on basic business related topics in Management, such as Finance, Economics, Methods, Law and Intercultural Communication. This program will give you a solid degree in international business with a distinct global approach and a solid knowledge how to build socially responsible business. 3 - 4 years (full time). 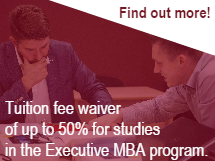 Study 3 years at RBS in Riga, spend the 4th in University at Buffalo School of Management (UB) and get a double degree diploma from RBS and UB.